Congratulations! It’s 24 hours till Christmas, and you’ve just finished wrapping the last gift. Awesome!! Oops. Wait a minute. Did you remember to get something for cousin Mike? What about that office party tomorrow afternoon? Don’t panic! We’ve got you covered. Here are some ideas for gifts you can make from things you probably have in your sewing room/stash. Everyone can use an emergency sewing kit! This is a great gift for anyone to keep in their car, office, dorm room, purse, etc. Turn a candy tin into a mini-sewing kit with these instructions from Cal Patch over at Sew Stylish. 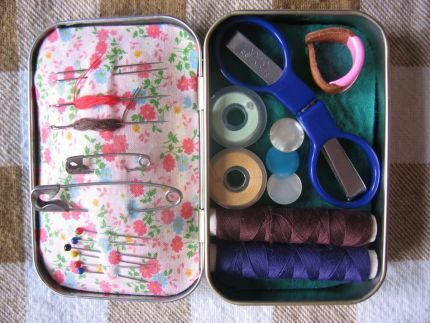 Southeastgeorgiapeach sent this travel sewing kit tip to Thrifty Fun. It’s so small it fits into an earplugs case! Stitch a pretty gift card envelope and fill it with a made-it-yourself gift card for a magazine subscription or online class. Print a cover or class description to put in the envelope. Or print your own gift card or coupon book for sewing chores (sewing on a button, hemming a pair of pants, mending a rip, fixing a zipper, etc.) or assistance (help with a sewing project, lessons on a sewing technique, an afternoon of quilting, etc.). 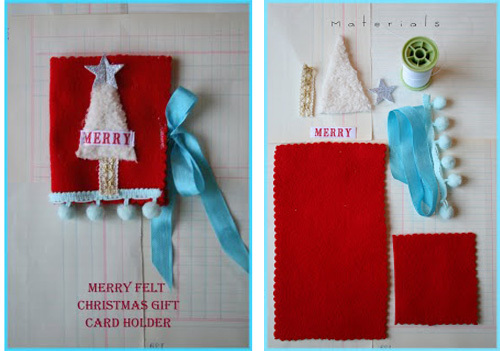 This adorable gift card holder from Joli Paquet uses little odds and ends of felt and trims. SO cute! 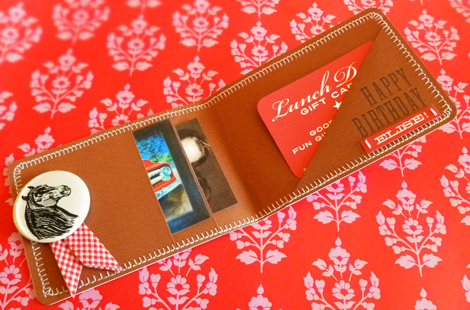 This faux-leather Paper Wallet Gift Card Holder from Just Something I Made is just the thing for the cowboys and cowgirls on your list. Print the free downloadable paper files and stitch them together. Done! 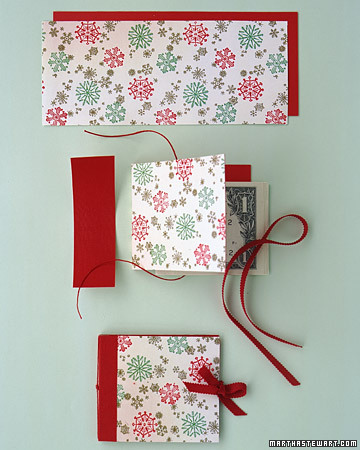 Make this sweet Gift Wallet from Martha Stewart using few sheets of paper from your scrap-booking stash or leftover pieces of wrapping paper.